What caused this peculiar configuration of geometric shapes in the desert, and how is it related to urban life in the United States? 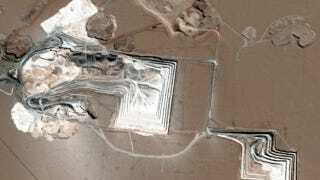 What you're seeing is a satellite view of a salt mine in Chile. Its products are being shipped by the ton to snowy cities across the U.S., where roads will be de-iced with generous scoops of salt. The salt travels here via International Salt, the City's supplier, from the Tarapacá Salt Flats in Chile, vast deposits inside ancient sea beds that now lie in the driest desert in the world (50 times drier than Death Valley). Despite having materialized 8-10 million years ago during the Miocene epoch, the tons of solidified geologic time piled beneath the bridge will dissolve away in a matter of weeks as they are spread atop hundreds of miles of wintry city streets. Before washing away with spring rains, this thin coating of ancient salt will first encrust nearly every exterior surface of the city - roads, sidewalks, bikes, cars, and shoes - with traces of deep time.